As my kids get older (4 and 2) I can find pockets of playtime to sew. They *need* me as much any more. Usually they do their own thing, trains, babies, etc... Sometimes they sit at the table with me and cut and glue fabric scraps to paper. Sometimes total chaos erupts out of nowhere. This was one of those times. These blocks should be the same size. Oh dear! That small one may be destined for the "signature" block on the back. Please tell me I'm not alone!! Mama, do you get interrupted? 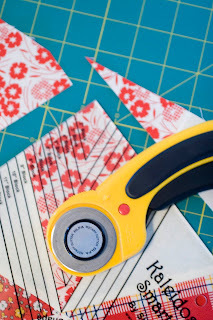 The Kaleidoscope ruler leaves you with scraps when you trim up your blocks. It's not really waste, but I couldn't throw the leftovers out. My poor Happy Campers! I found this silly little 2 1/2" square ruler. 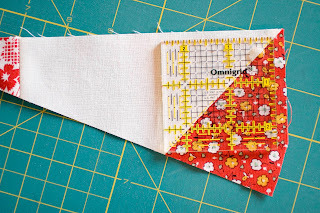 I bought it before I started quilting and I don't remember why! It fits perfectly on the scraps. Oh my gosh!! That's perfect for your scraps! 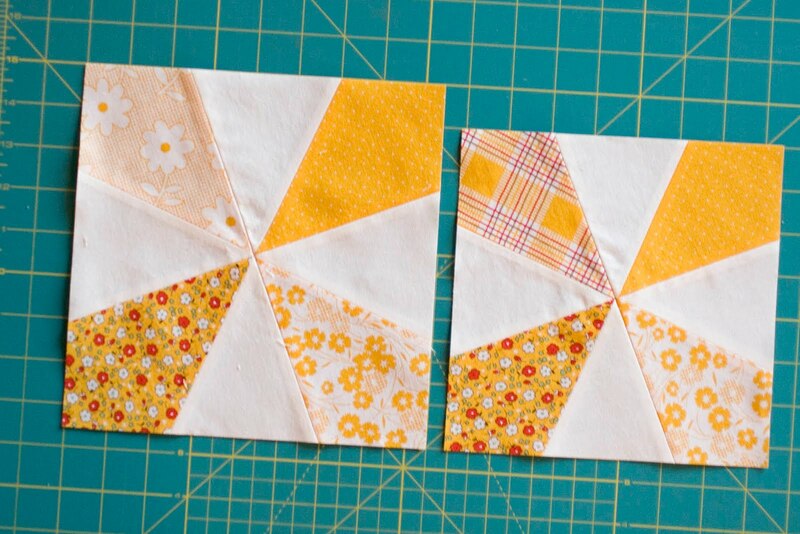 What are you going to do with the little half square triangles?? I can't wait to see! I'm so excited to see your finished quilt...mine is being quilted right now and should be back by the end of the month! what you do with those sweeties. this is great...i love the fabrics. it is nice when the kiddos don't need as much out of you and you can get some time to sew....but sometimes the scrap bucket can be irresistible. I have a 3-year-old son, so I know the feeling! 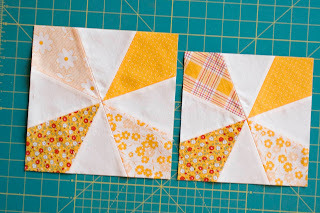 Your yellow blocks look great, and the smaller one makes a perfect signature block! Oh yes ma'am I remember those days. :o) Our children are much older now, and I am just learning to quilt, but there were other activities back then that I can remember being interrupted. :o) They are actually sweet memories now. Your little squares are too cute! I have that same ruler, it came in a set that I bought. :o) I love it! Adrianne, I did the kaleidescope quilt-along, too, and almost gave my scraps away till I saw your post on Flickr! Thanks so much! Now to find that little mini square ruler! And did you post your finished quilt yet? Mine are all done just not sewn together yet! I'm hoping to get/make myself a design board which will make the laying out so much easier! Thanks for sharing! Great idea, I am going to see if my kaleidoscope "waste" is big enough for my 2.5" ruler! 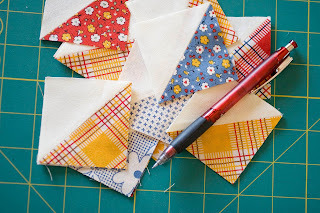 2 projects (with HSTs) for the price of one? Yes, please! BTW, I have loved your quilt for a while, it's gorgeous! 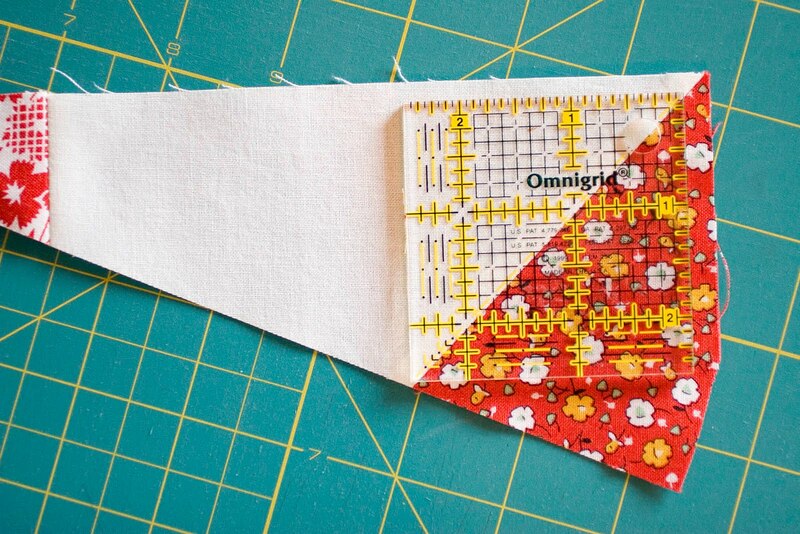 I just recently borrowed this ruler from a friend and whipped out 2 quilts back to back because it's so much fun! Look Ma, I Made a Pillowcase!